From September 2006 to June 2007, a group of ladies decided to see what "Monthly Bliss" was all about. Over ten months, they hand pieced eighteen 7-inch blocks that were then set diagonally with sashing, cornerstones, and a border. All the blocks were chosen because one would not want to machine piece them--tons of set-ins, eight points meeting (crisply) in the center, etc. The name "Monthly Bliss" came about because I thought something good should happen to women every month! 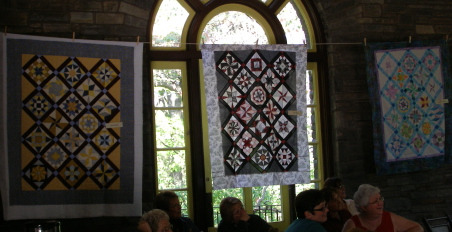 On October 10, a perfect fall day, O'Susannah's Quilts and Gifts hosted a luncheon at Watkins Glen State Park. 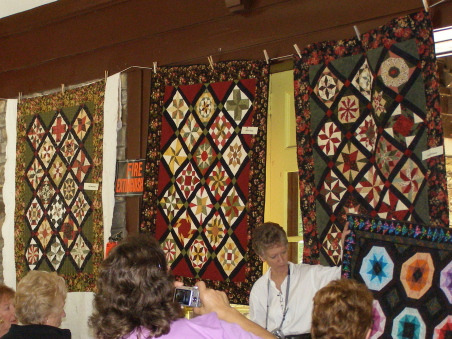 Sue Murphy, the owner, chose to showcase the quilts created in the Bliss class; the pavillion was a perfect site as you can see from the pictures. What a thrill to see so many quilts that were started in this class--some hand quilted, some machine quilted, some still in pieces, some basted to be hand quilted--all in one place and with many of the ladies who made them in attendance. And, proving that one can never have too much bliss in their lives, many of these ladies have signed up for Monthly Bliss 2, where they will make a new set of 18 different blocks! All the ladies have become members of the Bliss-ters (not to be confused with blisters--they hurt!). May the Bliss live on! Quilters: Lori W., Lori M., Shirley J.
Quilters: Cathy M., Bettina K., Carol E.
Quilters: Cathy H., Joey T., Mary Ann C.
Many thanks to Sue for hosting this wonderful event, and to all the students who displayed their works of art! Well done!!! Big news, quilt book fans! Anita Shackelford's new book, A Modern Mix, is finally out. It tells all about how to combine hand and machine quilting, along with useful tips on where to best use each technique and helpful marking suggestions. And...drum roll please....my Salsa quilt is featured on pages 20 and 21 and on the back cover!!!! I machine pieced the top and Anita longarm quilted it with a chile pepper design and with chile-colored thread. The quilting definitely made this top come alive. Look for the book at your favorite quilt shop, or, better yet, order it directly from Anita at www.thimbleworks.com. Then you can get it autographed! For any of you who are in the Groton, New York, area, I have an exhibit of about 30 quilts up at the Groton Public Library on Cortland Street (next to the fire station). Around December 1, some of the quilts will change, so stop back in December if you can. They are a mix of piecing and applique, and all but one are hand quilted. The quilt I made after 9/11 is hanging--it toured the US for three years and this is the first time it has hung publicly since then. Come and enjoy, if you can. I am reading Debbie Macomber's first non-fiction book, "Knit Together", and it is wonderful. It's like having a conversation with a friend. One of the things she talks about is "sustained focused effort". It was like a good whack to the head--WOW--focused effort--who knew! I'm sure that many of you are like me--trying to keep all the balls in the air at the same time and only taking enough time to do a bit on each project to keep it "up". After reading Debbie's words, however, I decided to try to accomplish more on at least a few things while juggling the rest. WOW! In three days I had finished quilting three small pieces. And made good headway on another one. Since I like to hand quilt, this was definitely an accomplishment! I have finished binding five quilts in the past few days and am already working on some holiday gifts. Focused effort, indeed! What a rush! Please pass this info on to everyone you know--let's let our soldiers know how much their service means to us.